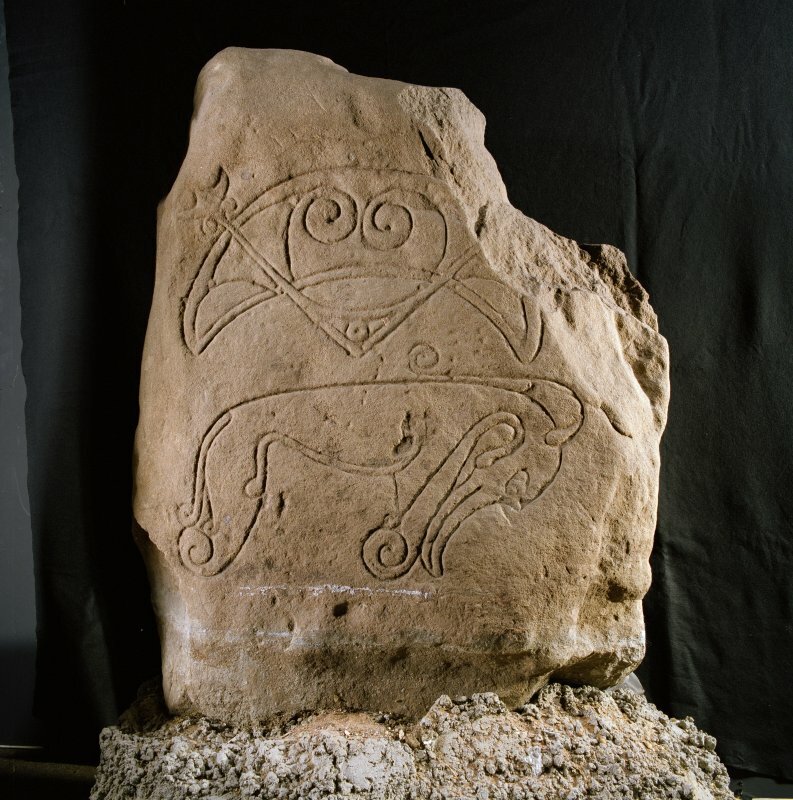 Scanned ink drawing of Strathmartine 1 Pictish symbol stone. Present location: McManus Galleries, Dundee (1969-269). Evidence for discovery: recorded by Stuart in the mid nineteenth century built into a field dyke south-east of Strathmartine Castle. Sometime in the twentieth century it was moved to a private garden in Dundee, and thence to the museum in Dundee in 1969. Present condition: the top right corner is missing but the carving is good. 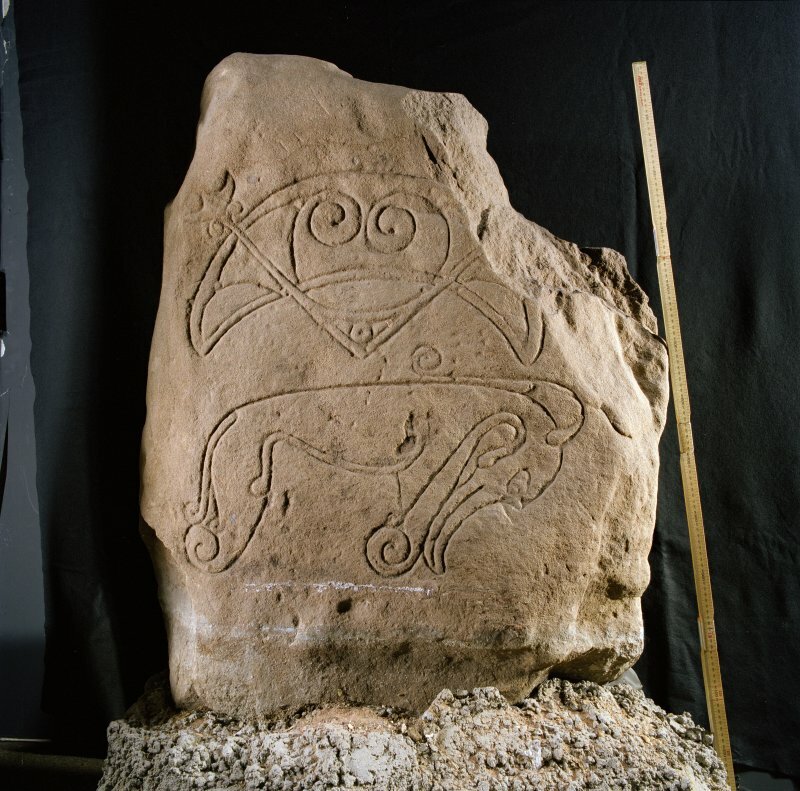 Two symbols are carved on this stone: a crescent and V-rod over a Pictish beast facing right. A small part of the crescent and V-rod is missing. Primary references: Stuart 1867, pl 102; ECMS pt 3, 209; Fraser 2008, no 68. A Class I symbol stone is noted in a dyke on the farm of Strathmartine Castle (Stuart 1867) in a field immediately SE of Strathmartine Castle, and between it and Gallow Hill (Allen and Anderson 1903) (The latter description places it in the area centred NO 374 361). It was moved to 10 Glamis Drive, Dundee, and is listed there as a scheduled monument (OS 6" map annotated by O G S Crawford, undated). It was seen there, at NO 3692 3024, by OS field investigator (J L D) in 1958, but has since been placed in Dundee Museum (Accession no: 1969-269). Of red sandstone, it is 1.35m in height and bears an incised crescent and V-rod and an elephant symbol. For Dundee Museum, see NO43SW 91.2. J Stuart 1867; J R Allen and J Anderson 1903; H Coutts 1971. Class I symbol stone -Strathmartine 1-shows crescent and V-rod above an elephant.